Kick off your weekend with an outdoor musical experience at the Eugene and Marilyn Glick Indiana History Center at 450 West Ohio Street in downtown Indianapolis. 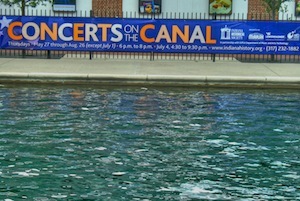 The 2011 Concerts on the Canal series features a spectacular lineup of jazz, blues and R&B entertainers. The concert series is held at The Kruse Family Stardust Terrace at the History Center on Thursday evenings through Aug. 11 from 6:00 to 8:00 p.m.
Concert guests may bring their own food and nonalcoholic beverages, or purchase items from the on-site café, outdoor grill and cash bar. Chairs and blankets can be brought in for free seating or tables can be reserved, for a fee, on the terrace. Parking is available on a first-come basis. Come early if you’d like, as the Indiana Experience remains open until 6:00 p.m. on concert days. For prices, reservations and a complete concert series schedule, visit the Indiana History center website.